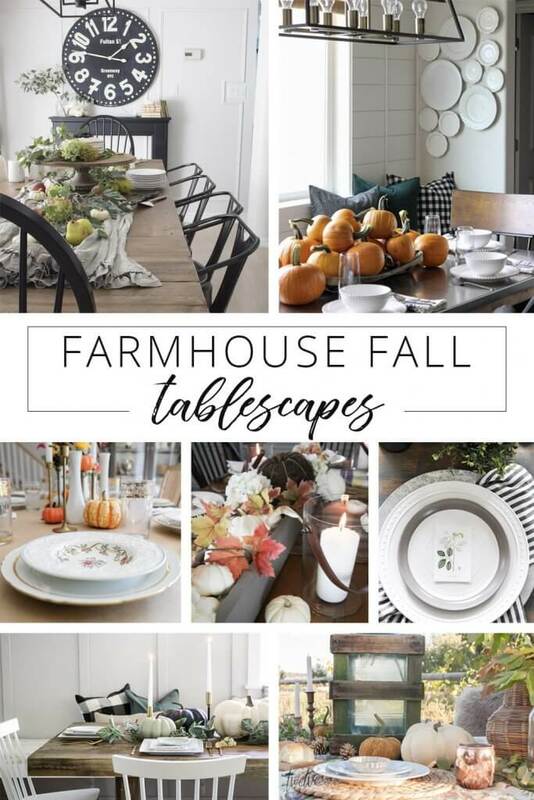 Yesterday I posted all about my glamorous farmhouse style fall tablescape. And as promised, I have more tablescape goodness today! 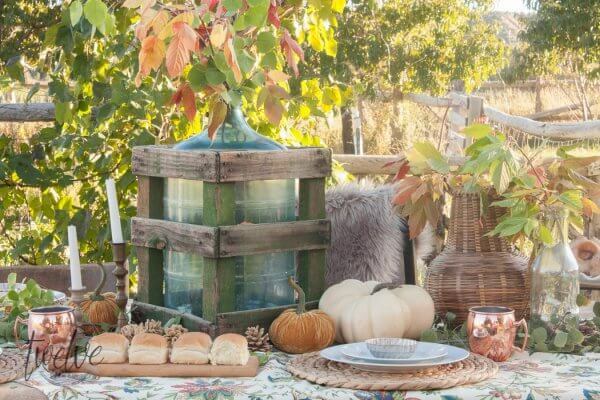 Today I wanted to how you how to rock an outdoor fall table for fall entertaining. 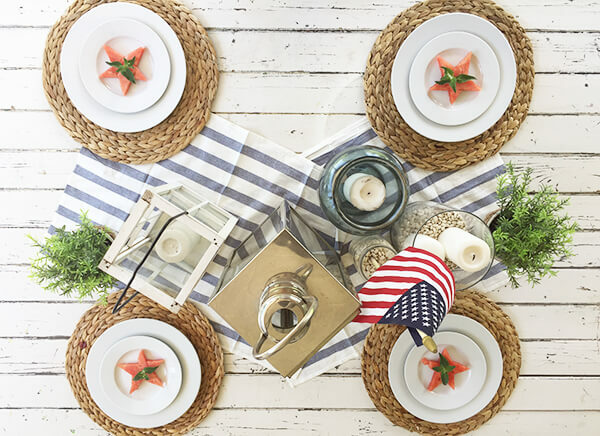 Entertaining outdoors can be a tricky situation if you don’t know how to plan for it. One thing we really love to do is entertain outside. We love spending time in our backyard or in the forest during the fall season. The weather is so nice during the day with touch a bit of chill that it feels as if its a necessity rather than a chore. Last weekend was rough, and I mean rough. We were able to get some pretty fun family photos done while out on a drive to see the fall leaves. I was so thrilled that my kids sort of cooperated! Here’s just one of our entertaining shots! But as we drove home from our sightseeing excursion, I started to feel sick, and the feeling gradually got worse as the day went on. Then a 2 of our kids got sick….and moments later….my hubby. Isn’t that the way it goes? 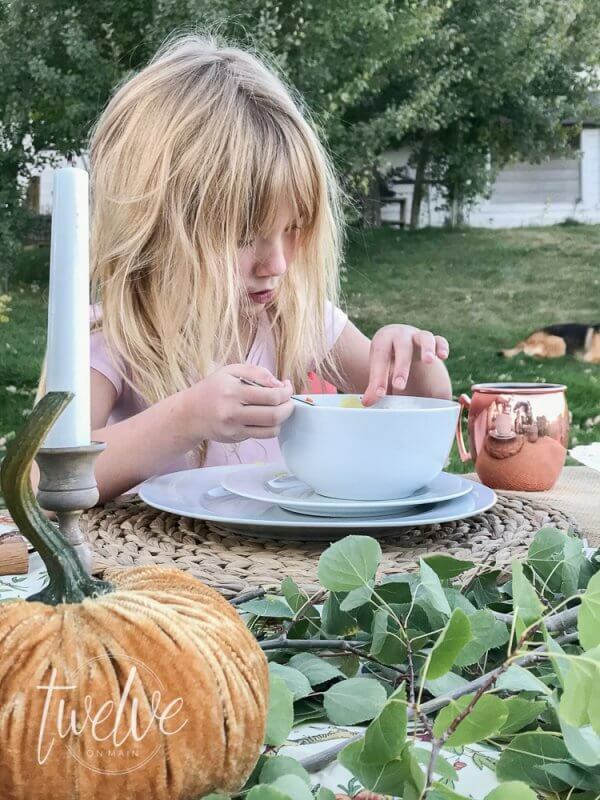 No nap for me, and I was in a panic, because I was trying to work on a outdoor fall tablescape for this awesome bloghop that my friend Shannon from AKA Design put on and invited me to participate in. You can check out all the other incredible bloggers in this tour at the end of the post! 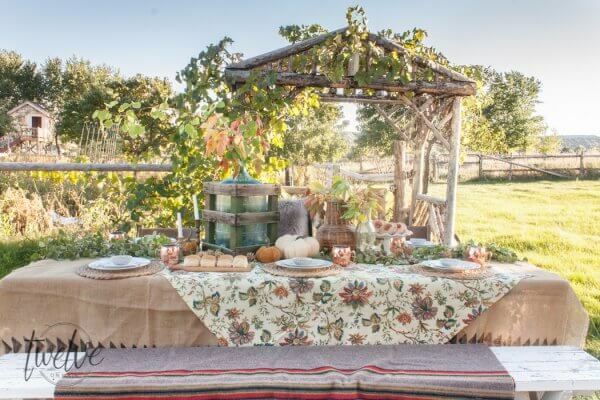 I had grand ideas, and I could see this outdoor fall tablescape in my mind, but my body just was not behaving. So, I slept and laid around for a day, hoping to recuperate. The next day proved no better so I decided that I just needed to get to work. And then the wind picked up. I tell you I could not catch a break! So, I waited, and I decided to create an indoor themed table just in case my grand plans went to pot permanently. 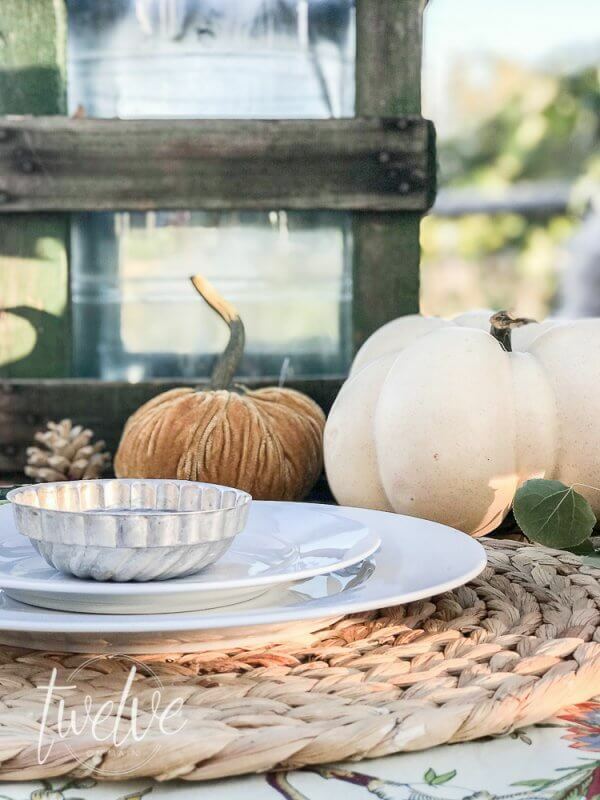 And I was in love with my indoor tablescape, but I was still wishing I could create my outdoor fall table for fall entertaining. The next day, I was still feeling quite ill, but the wind had died down. I knew I had my chance. I got to work. 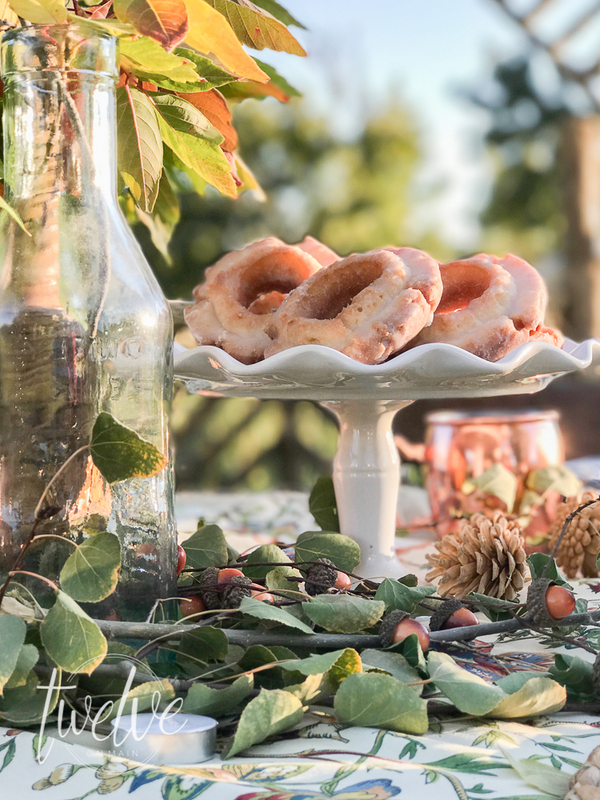 And now here is where I tell you hoe to create an outdoor fall tablescape for fall entertaining with a few tips on how to pull it off successfully! 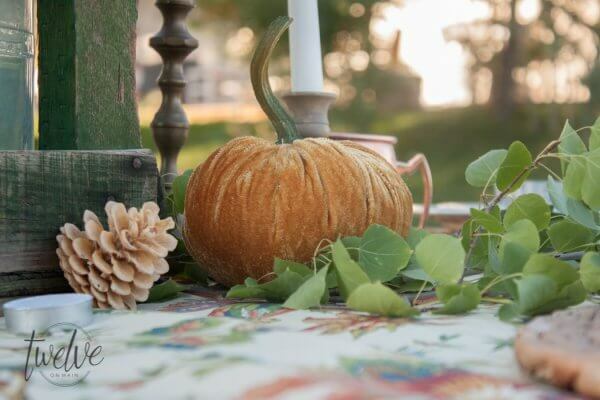 Select a location for your outdoor fall table…. You want to start by selecting a good location. Of course, I was looking for a great place to take pictures, but I also needed to find a nice level spot, not too far from the house so that we could still go back and forth without much work. I chose a spot just outside my garden. The backdrop of the harvested garden was so very appealing to me as well. Also, I had to incorporate my incredible grape arbor that was built by my husband. It is the most incredible feature in my yard. The arbor also serves as the entrance to my garden. I think it is an amazing spot and I knew I needed to document it. Also this spot is not far from our backdoor. I would say only a short walk of about 40 feet or so. So I had the location selected. Next you want to plan. 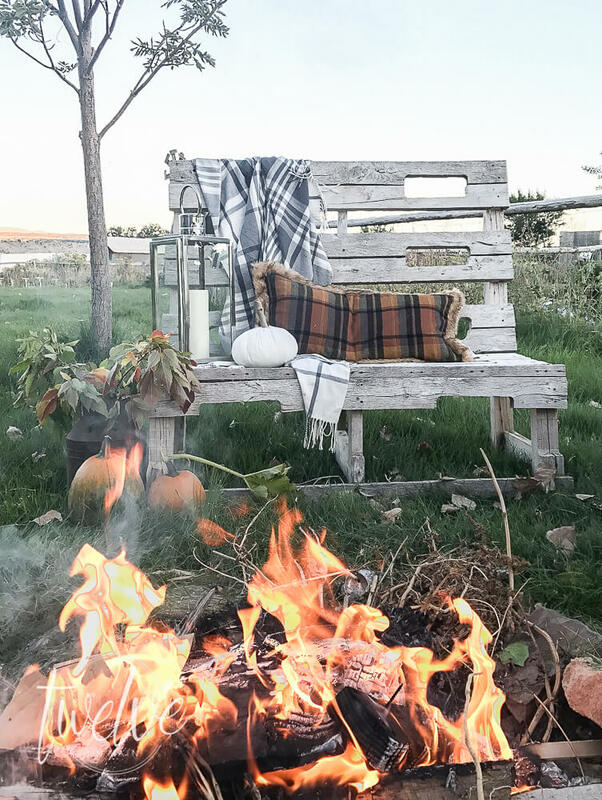 Since you are wanting to entertain outdoors in the fall, it is a good idea to have a plan to keep people warm, if the temps get too chilly. Whether you supply blankets, a portable propane heater, or a fireplace, it is a goo idea to have something to keep your family or guests comfortable. There is one other reason why I selected the location I did….for the fire pit. We have a small handmade fire pit near our garden area that we use all summer and fall as a place to have a fun cookout when we can’t get out into the woods. So, I chose this spot so that we could keep a fire going and keep us toasty warm when the temps got a little cooler. This proved to be a great idea. We were able to keep a roaring fire, and it kept us cozy and staved off the encroaching chill in the air. I set up a little place to sit and “chill” next to the fire so that there was a place to keep warm if they got too cold. I love this chair. My husband built it out of pieces of pallets. But not the usual thin pieces…he used the thicker pieces that are usually discarded. Mix and match and use what you have….. This is where this post gets fun! 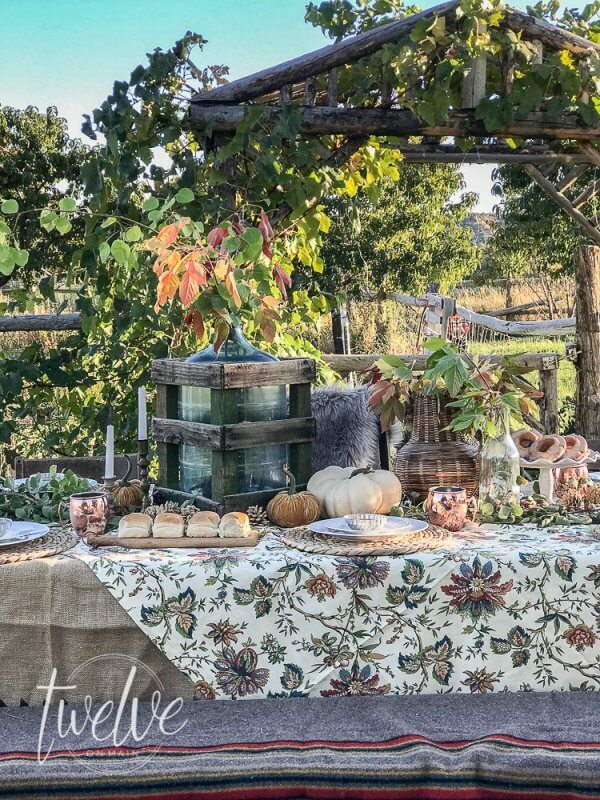 I really went outside my comfort zone to create this outdoor fall table. My initial inclination was to keep it simple, and neutral. But then I had this vision of a bountiful table, full of texture, color and ambiance. Now, I don’t live where I can just run to the store and grab all those things that I feel inspired to incorporate. Nope, I have to shop my home and use what I have. That is unless I am on top of things and have prepared a few weeks in advance…which doesn’t happen too often. So I went into the archive of stuff that I call my sewing closet and started to do some shopping. Jackpot! I found a set of 4 burlap curtains I had made a few years ago with a geometric design on the top and bottom of them. There was also some fabric that I had bought to make other curtains. It was a nice pattern full of fall colors. And….at first, I didn’t think they would go together at all…but then I started layering and realized they looked so good together! 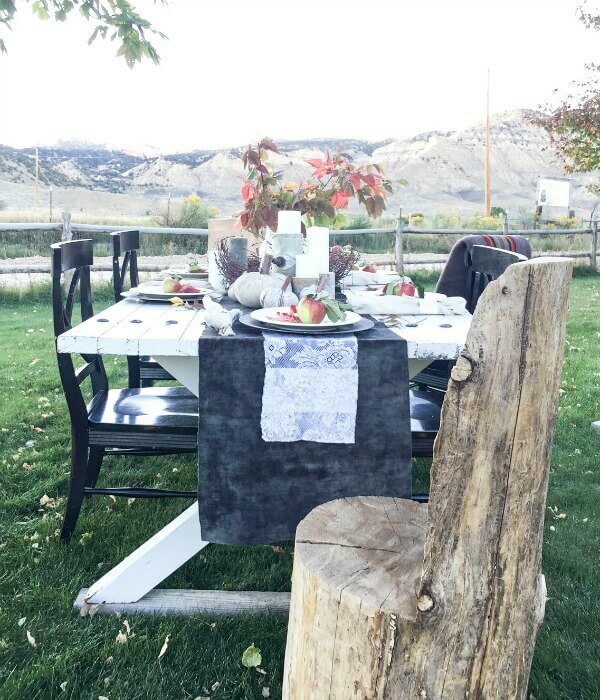 I used my farmhouse style picnic table as the base, and then layered the fabrics on top. Now that I had my location set, my heat source, and some supplies, it was time to get down to business. 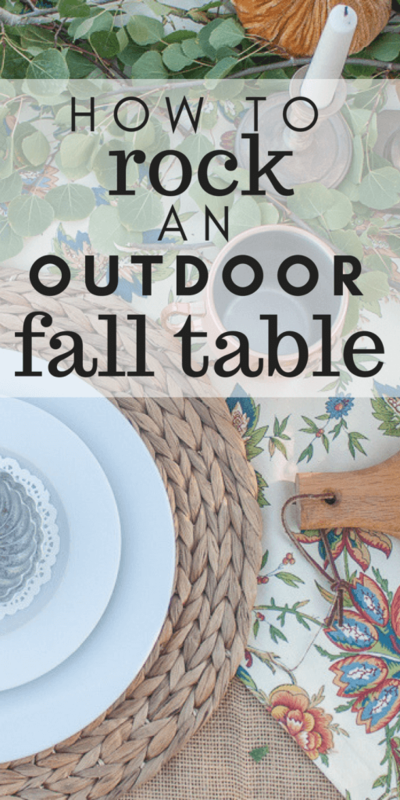 Setting that outdoor fall table. Since this table was outdoors, and since there was so many distractions all around I wanted to really try to add some focus to the table. 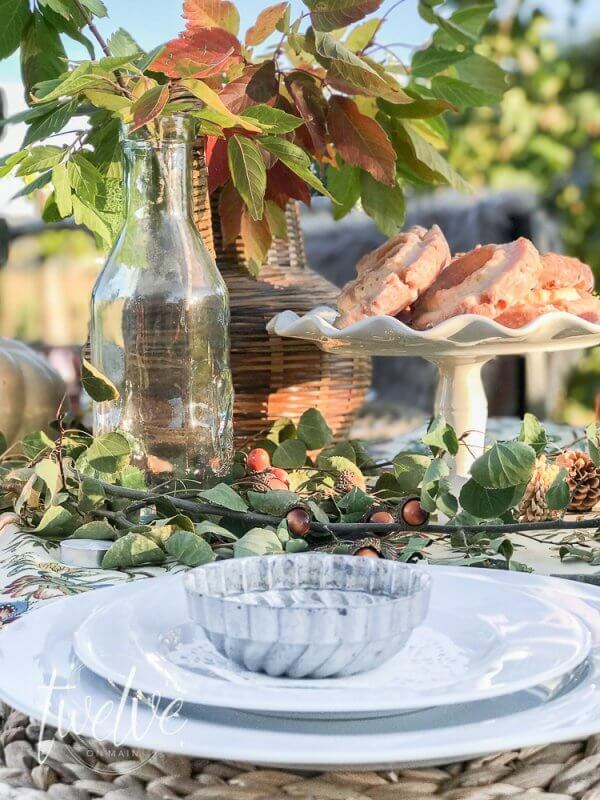 There are a few tips that you can use to create an incredible outdoor fall tablescape. 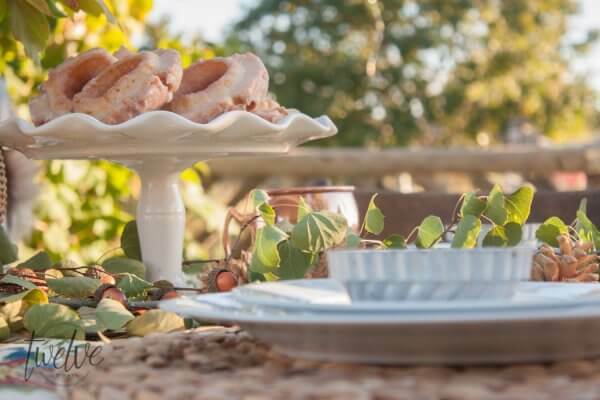 Add height to your outdoor fall table…. Start with something tall. I chose my vintage glass water jug filled with fall leaves from my tree. Yes its that cold here that our leaves are changing at our house. 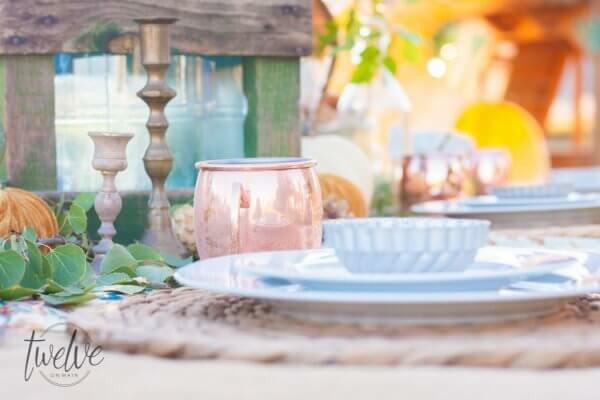 Adding height to your table is great, but sometimes it can block your view of the person across from you, creating a difficulty in conversing and entertaining. So, either keep it high enough that the the bulk of the flowers or leaves are above you head, or set it up slightly off center. This is what I did. I set up my vintage water jug off center. That way the people sitting across from each other could still see and talk. Now, since I set it up off center, I needed to balance it, so I added some smaller jugs, including the wicker one that I found at a thrift store. I really love tables with mix and matched chairs, and I thought this was a great time to do this. I used some old wooden chairs that i got at an antique store and then mixed them with a black one from my dining room and used one of my picnic table benches. Mixing and matching creates more interest and drama. I added my favorite Pendelton camp blanket to the bench, as an added source to keep people warm. 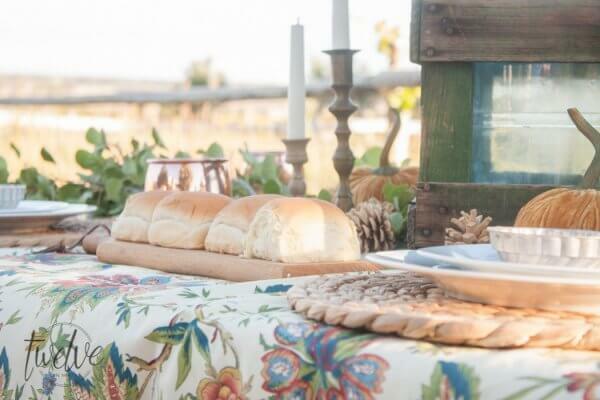 Now dress up that outdoor fall table…. 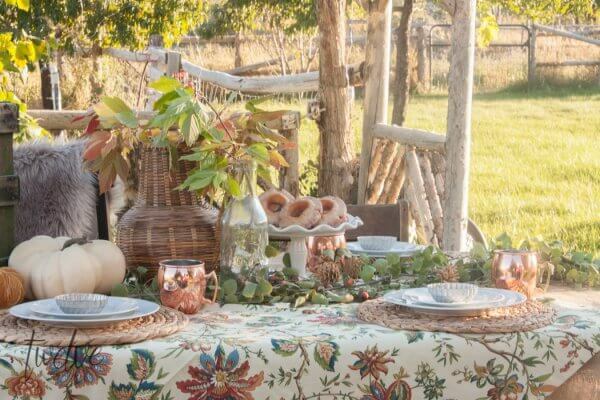 The last thing you will want to do is dress up your outdoor fall table with accessories and place settings. This is a great way to make a WOW statement. I used my seagrass chargers because, well I love them so and they have so much texture! I topped them with my favorite white dishes, and then I used my vintage metal jello molds as another pop of interest and texture. To say that these WOWed would be an understatement. My kids were obsessed! They kept asking questions about what they were, and how cool they were! I added some velvet pumpkins, antique candlesticks, and a garland made from my Aspen tree. Enjoy yourself, and the fruits of your labors…. Now that my outdoor fall table was ready, it was a shame to let it go to waste. 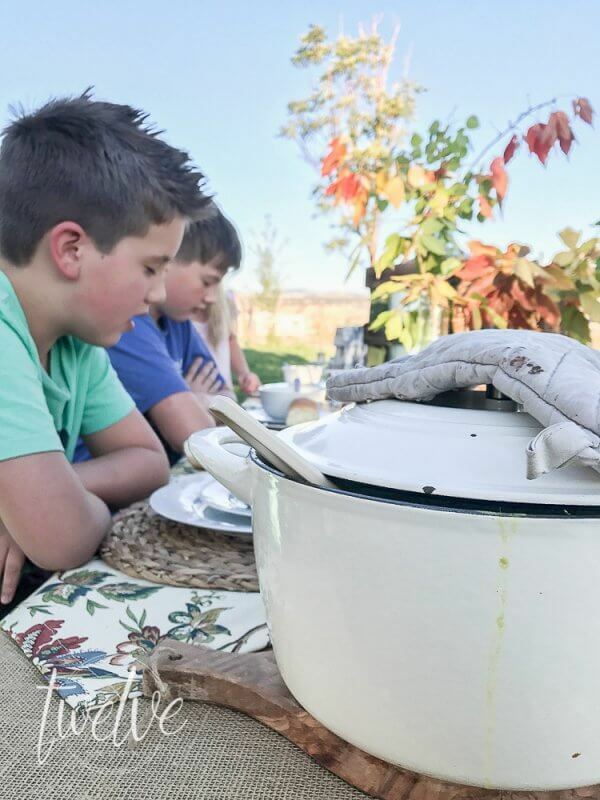 It has become a tradition that I set up an outdoor fall table, and then we as a family enjoy the space, eat, chat, and enjoy each other. And, since we were all sick, and my good friend had dropped off a care package that day with chicken noodle soup, we decided it was the perfect setting, and a good idea to get everyone outside for a little fresh air. Even in our pajamas and dirty dance clothes. There is nothing better than enjoying the company of our family. 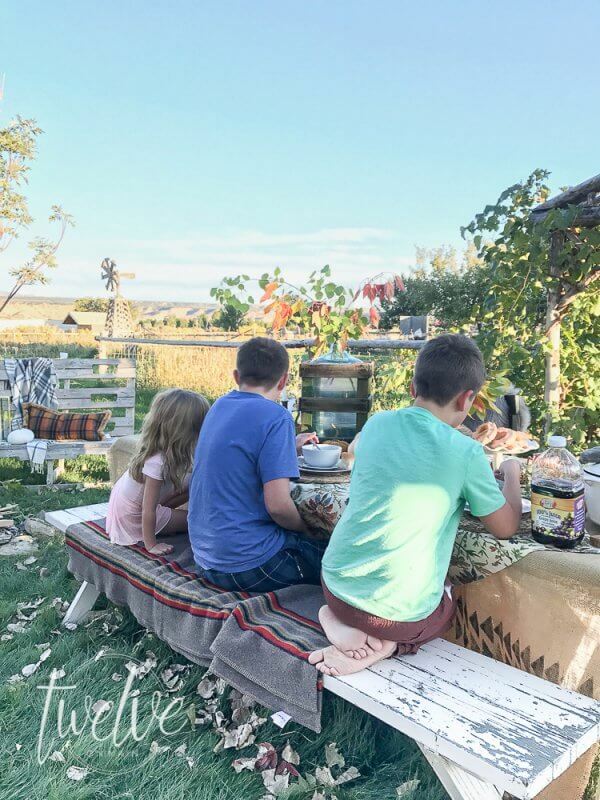 The kids feel special, since so much effort was made for them to sit and eat outside. They kept warm by the fire, and as the sun set, we sat, ate, laughed, and fought. Because lets face it….they are kids, and they have to ruin it somehow! But overall, it was a wonderful evening, topped off with some donuts…because donuts always make you feel better! 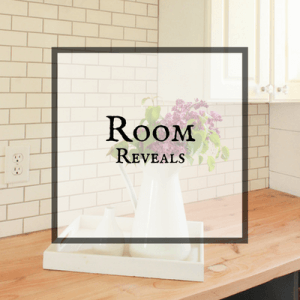 As a home decor and DIY blogger, it seems like we are always supposed to put the beautiful aspects of our life on camera, and I am okay with that, because I love beautiful things….but, its definitely not reality. Sometimes my house is clean, and everything is in order. But the majority of the time I am just holding on by my teeth, hoping that things work out. All the while shoving things from room to room so that they aren’t in my cameras view. This weekend, I truly learned what it is like to marry the two together. To be real, and to have beauty while having some very ugly aspects that you just cant avoid. 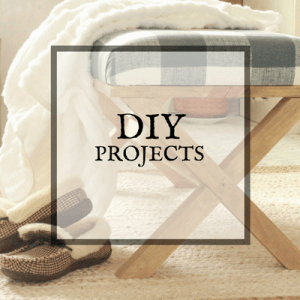 This post is more about conquering those hard times, instead of showing you all the pretty things I can make. Because in the end. I love the beautiful side, but the pretty is not possible without the ever present ugly. I hope you enjoyed seeing what our family life is like, with all our imperfections, and with all the beauty. This time of year we take stock of what we are thankful for…and I am thankful to be going through life with this amazing group of humans. 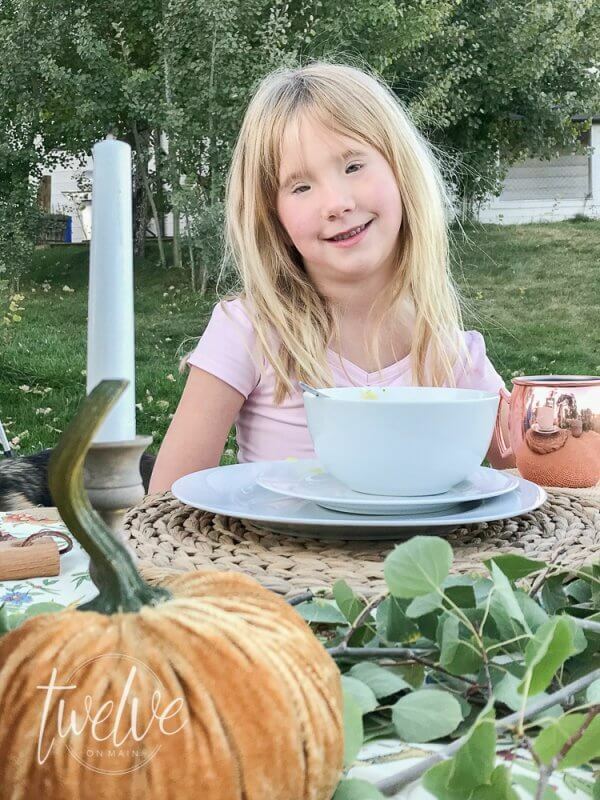 I am also grateful that we were able to spend some quality time together with our outdoor fall tablescape for fall entertaining. 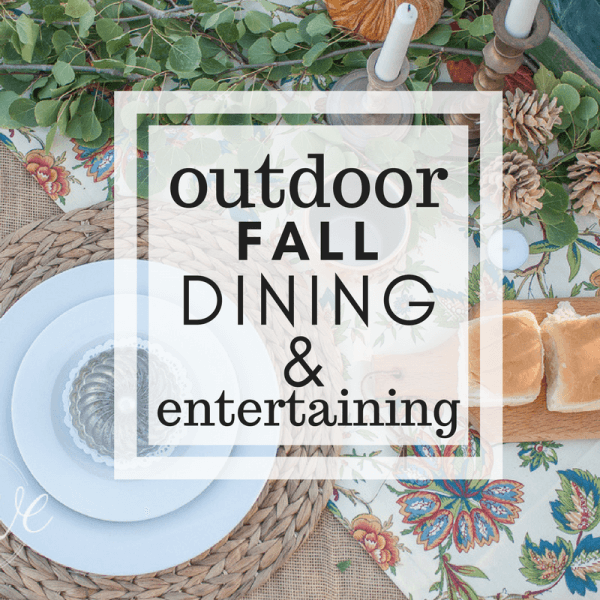 Do you want more info on any of the products I used in my outdoor fall table? Check out the images below! I am truly grateful that you have chosen to stop by and share in my day to day life. My blog just would not exist without you! I am so very grateful! And I would be even more grateful if you would PIN IT for later! 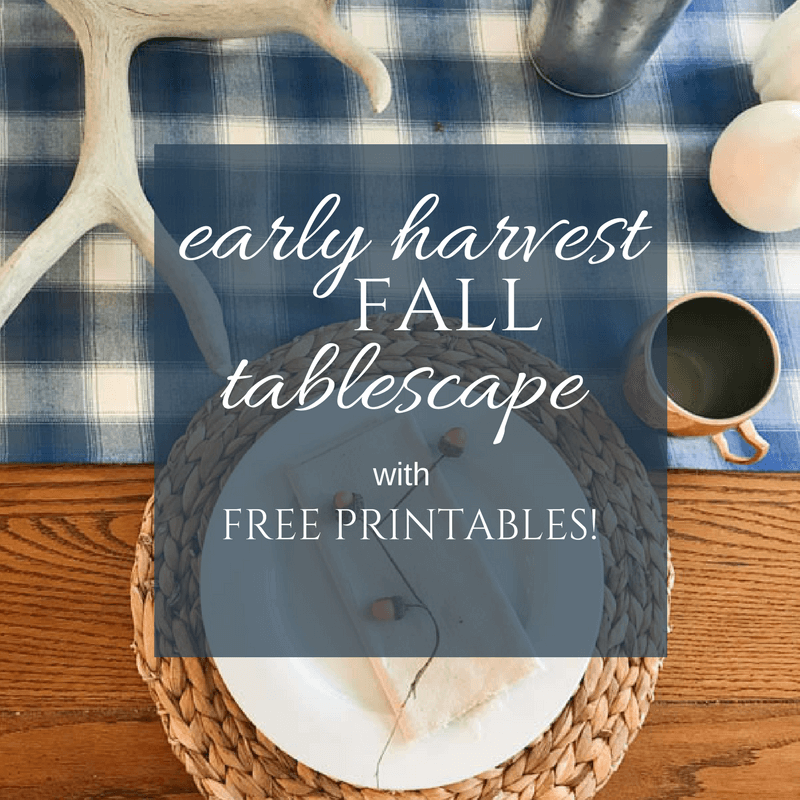 Now make sure to check out all the other incredible fall tablescapes! Links Below! 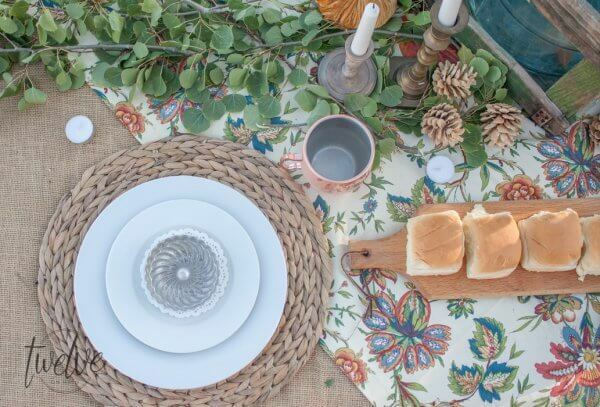 Check out these other tablescapes from other seasons! My, my, my…how creative and beautiful! I always enjoy the ideas and imagination of other bloggers. 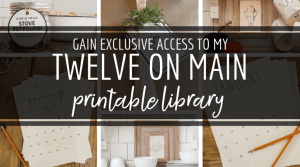 It’s so fulfilling to see how challenges are met, how each person interprets a theme, and, of course, what kinds of gorgeous goodies are in their decorating stash! 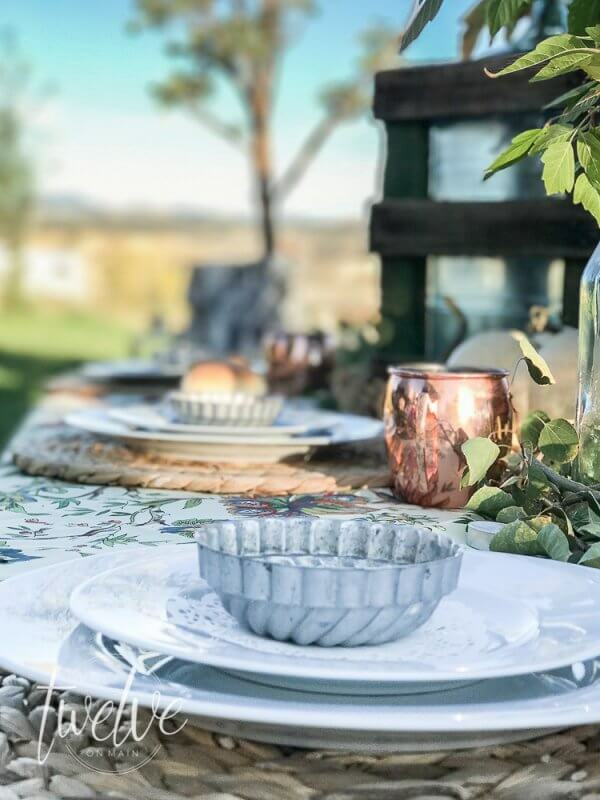 I love how you met the challenge of being being unable to just run down to the mall, how you interpreted the perfect outdoor table setting, and, of course, your gorgeous placemats, serving dishes, and other decor. I’m sorry to read that you and your family fell ill. For it to happen so close together definitely made it even more of a challenge, I’m sure! I hope you are all totally back in the pink and ready for a fun-filled weekend ahead! 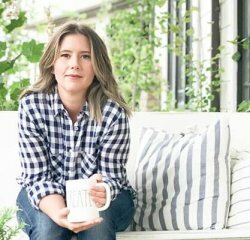 Good read and great post. You have a beautiful family. I look forawrd to seeing more of your decorations. 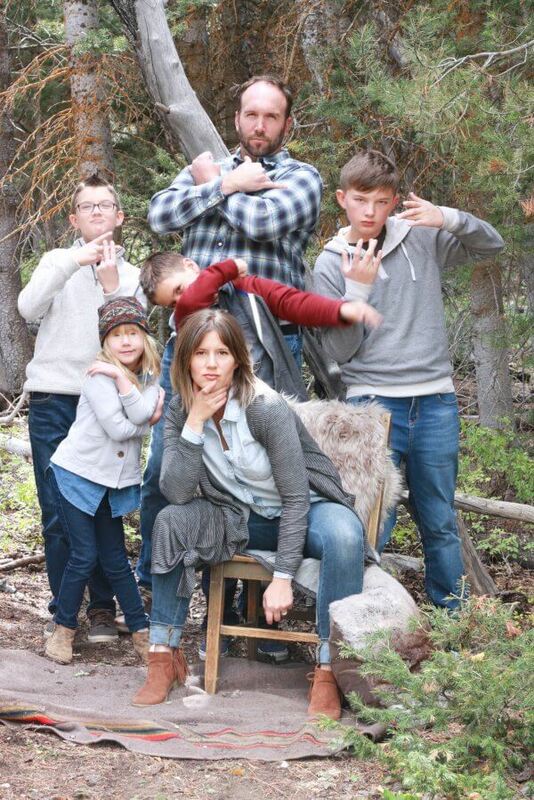 Just gotta say that your fun family photo shoot pic is AMAZING! Now I’m wondering if I can get the kiddos to do something equally as fun.